Consulting the ACLOS alleged chlorine attack checklist ... he has no clear chlorine indicators: His dark. hooded eyes look tired, not damaged or tearing. He has normal skin tone with no red irritation, and no cyanosis (his lips aren't visible, but his fingernail beds are not blue at all). The mask suggests (but doesn't prove) some breathing problem, but there's no sign of coughing blood, or a red face from violent coughing. And there's no bleaching of his shirt. This isn't definitive, but it seems more than likely he was not killed by chlorine after all. 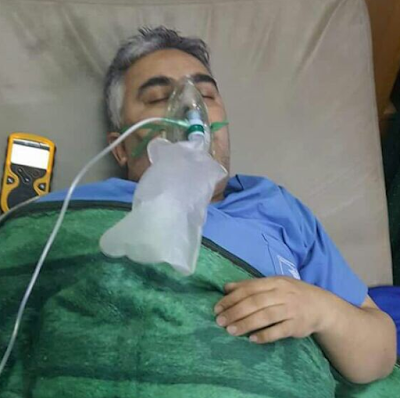 For an example of what he should look like, refer to a firefighter called in for rescue work after an alleged rebel chlorine attack in the government-held part of Aleppo's Old City, on August 2, 2016. It's said he was one of 13 people who died when rockets were fired by Harakat Noureddin al-Zenki (the infamous advocates of child beheading). Note his swollen eyes pouring tears, skin redness and mild blue tint (cyanoisis, from low blood oxygen), and blood from the mouth or nose. This is an extreme case, but it's likely Dr. Darweesh would be too, if he was exposed for long, in an underground hospital. But any signs are so faint it seems there just aren't any. Dr. Darwish shows none of that. This is standard, actually, for the fake type of chlorine attacks consistently reported by the murderous and science-impaired Syrian Islamist opposition. 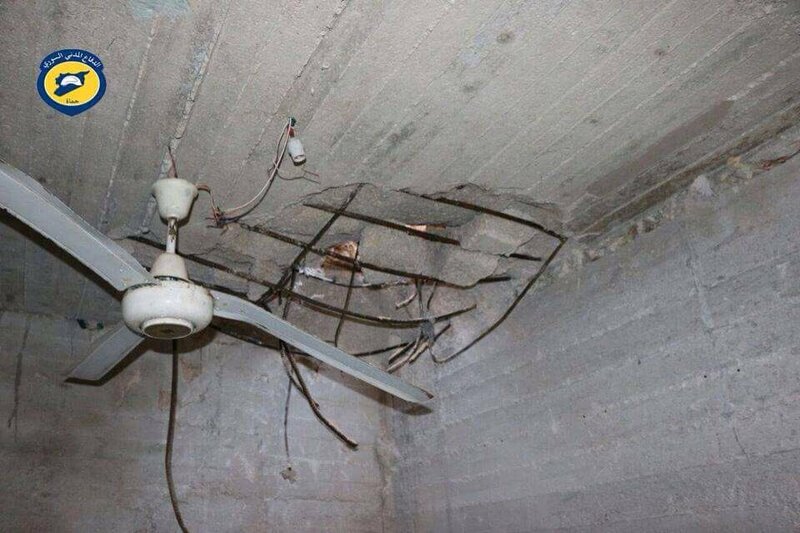 The hospital is dug into a cave area, they say to withstand regime and Russian bombing. White Helmets provide this photo of the entrance. Syria Direct has a detailed report others (like EA Worldview) are citing. According to this, the hospital "was set up in November 2016, one month after the town’s sole medical clinic was destroyed by a reported Russian airstrike." 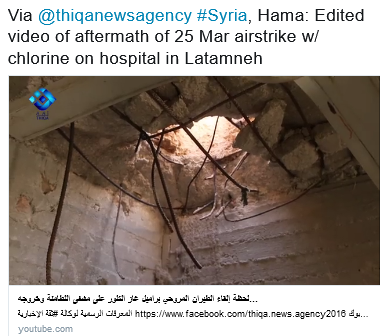 A helicopter dropped a large yellow canister through the concrete roof of the Latamna Surgical Hospital at 1:30pm on Saturday afternoon, Abadah al-Mansour, the hospital’s spokesman told Syria Direct on Sunday. Chlorine gas was then released, he claims, spreading throughout the rooms of the underground hospital. Without sufficient ventilation for the gas, 35 people were injured—14 of them medical personnel—and three were reportedly killed, including a surgeon. Orthopedic surgeon Doctor Ali al-Darwish was operating on a patient when gas reportedly entered the hospital. “He refused to leave so he could save the patient,” said al-Mansour. “He paid the price for that with his life, and the operating technician and anesthesiologist are still in critical condition.” The patient al-Darweesh was operating on also died. Troubling report on the symptoms: “most of the injured suffered from fainting, red eyes and shortness of breath”, the Hama Civil Defense reported. Shortness of breath plus massive pain and severe coughing, check. red eyes, check (but not evident with the one seen fatality). Fainting, no. As I recently explained here, rebels in Syria think chlorine makes victims black out or become paralyzed, leading them to lay there breathing in too much gas. But elsewhere, at other times ... in the world ... that's not true. This running claim is bogus, and suggests they rarely deal with real chlorine cases, and instead they're encountering something different or, more likely, they just keep reading off the same poorly-researched chlorine symptoms they were handed once long ago. In the Syria Direct piece, a Doctor Abdullah a-Darweesh (no relation?) provides this photo of the gas cylinder allegedly dropped from a helicopter. I'm still not confident saying how high up this must have fallen from, or if it could be deformed some other way, like launched against a wall at high speed. It is some pretty serious distortion, and I can see why people might presume it was dropped from a helicopter thousands of feet above. Also, I'm no expert, but the way the distorted end is so strikingly flat, it looks like it hit concrete laid on the ground and flattened against it, not like it broke through unsupported concrete. At least four other photos of the canister are around, but here's a good image of a close-up view of the distorted end compared to another view. The corner photo shows an apparent indent on the rim, perhaps the size of the reinforcement bars in the concrete ... that is one point in favor of it lining up after all. Highlighted markings: CL (meaning chlorine, as this color of yellow paint is also meant to indicate) and a familiar V logo and name NORINCO CAF. The same appeared in the first attacks in 2014, and NORINCO was said to be a Chinese arms maker, meaning these were designed as weapons. Not sure if this was proven either way, but I'd guess NORINCO also makes other stuff, including chlorine tanks, which Syria bought some of, before they were stolen and used for these incidents. VDC query, all Hama deaths by shelling and warplane shelling on 3-25: the doctor Ali al-Darweesh, doctor, from Kaferzita, is listed as killed in Lattamna by Syrian forces. He's listed as killed by "warplane shelling," but the entry notes "due to the air regime's helicopters shelling of chlorine-fired." No one else is specified as dying by chlorine or in the hospital. A shepherd boy from Lattamna is listed as killed by artillery shelling - was he the patient Dr. Darwish allegedly died treating? 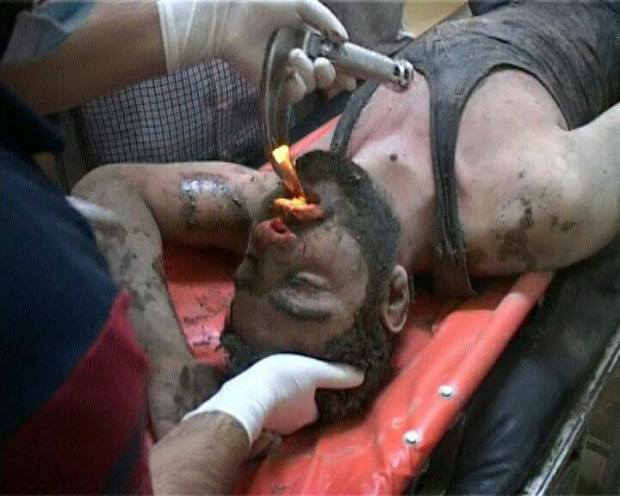 Wounded by the shelling (or whatever) but actually died, supposedly, from the chlorine? Three other Hama people were displaced to Khan Sheikhoun, Idlib (just 10 km north) before they were killed there this day, by Russian warplane shelling, of course. The two women are married, and one - Fatima Mohammad Abd al-Samad al-Satouf - is from Latamna. The other, Ietidal al-Awad, is from Taibet Al-Imam, and listed as the "wife of Mohammad Abd Alsamad Alsatouf." (so he had a wpoman's name added and got listed wrong?) Also a guy from Morek died in the same incident. At least 8 Idlib people, 7 from a Merati family, were alos killed by bombing in Khan Sheikhoun this day, but with the bombing blamed on Syrian forces. So was the other attack against some IDP shelter? Anyway, this all has no clear relation to the incident under study, and so the VDC's records seems to help little in this case. Sorry if this has already been mentioned, just a question about the numbering of bodies in the "Caesar" photos - the recent 'Syria's Disappeared: The Case Against Assad' documentary had an interview with Mazen Alhummada. He says he was arrested March 2012 and interrogated at Mezze, where he says they use his real name. He claims to then be forced to confess through torture but ends up beaten so badly they send him to Hospital 601 for 5 days. When he arrives at the hospital, the hospital give him a number “1858” – i.e. he had no ‘detainee’ number while being interrogated. Does “1858” fit in with known numbers? He did not die (despite claiming the hospital meant “extermination”!) and was released after 18 months. The documentary also shows the note given to Ayham Ghazzoul’s mother. I’m not sure if this has been shown before somewhere else and she already knew the exact date of his death, but thought it might give a clue as to the genuine system used to document deaths? Hey, Andrew! Off-topic post, but right site anyway. I didn't hear about that show ywt, so thanks. Will check it out soon. Mazen Hamada is brought out huh? What a crackpot propagandist. I considered him in some detail, same number already given and considered. It's a weird possible fit considering AF Intel's mostly random numbers. But his story is ridiculous. Lines up with a similar released witness' AF intel #1958. Weird coincidence there. He's one of those rare few with some kind of story and papers. Their stories carry a lot of weight with thousands of anonymous bodies piled on top. I haven't considered his in mass detail, but some. App. didn't post a profile yet. The papers might be real or fake. I'd be skeptical that's even his real mother, but I don't know. After seeing what they say and how, I'll have a better feel. A good example of how documents relate comes with Mahmoud al-Zoubi. Real papers there, I suspect, for Caesar photos victim #1, back on April 29, 2011. That body was clearly handed back, maybe doesn't really belong. His "prisoner #" was app. 7 or 8, meaning unidentified body #, later altered by someone into his hand-over date. Thanks for the reply, sorry for putting comments in the wrong place, I just wanted to ask someone who has researched it, wasn't sure if anyone would see it. Reading the New Yorker article, I see they've been misleading with the editing and Mazen was given the number just before going to hospital. Doesn't explicitly say what the point of telling him the number was, I can't think of one. No worries - comments do the most good with the subject so it can all be seen together, but lots of comments lately on whatever's up top. Fair enough, and good news is there are comments. Mazen was told his number for the same reason he was made to witness scenes right out of the Caesar photos - so he could be released and tell the world, with tears welling over and stuff. I've seen the video now, much of it, took some screen grabs, and have a partial review coming up. Hopefully I'll find a working copy if I need it again. Dr. Islam ... jut saw that. On video he says chlorine, in the tweet sarin. Couldn't even tell where (Lattamna? Doesn't seem like a fit. Is this a different episode?) He's doing the Bana thing going through Rowling? Funny. could it be it's all one &the same cave ? I see Bellingcat has picked on this attack up recently. Isn't it amazing that Shajul Islam was claiming this supposed chlorine attack as 'sarin' and that people still believe that a doctor wouldn't take the risk to move a patient away from chlorine when it is an immediate danger. How could the doctor physically carry on the operation when there was enough chlorine in the room to kill him.. the story is completely stupid. And Shajul says after that the boy survived, and he took over treatment. But I hear he died, same day I thought. Muddled. And re: Latamnah, tanks, chlorine, sarin, there's the March 30 attack. This video seems to show the 3-25 chlorine tank (as if on display) and later, in situ by a road, a different yellow chlorine tank even more twisted and torn open. From this day's attack? Fired from a jet? Nope. Separately, some parts of an improvised device, maybe for the "sarin" that made people hallucinate... Hm. Was SAMS onto something? There are buildings up on the hill in one of the shots so someone good at geolocating will be able to get the exact spot. Darwish "continued operating until he fell unconscious" http://doctorsindanger.com/dr-ali-darwish-en/ but funnily enough can't find details of what operation he was meant to be doing that meant he couldn't move the patient (orthopaedic surgeon basically in a cave!) or whether anyone thought to just roll the chlorine cannister out of the entrance, maybe try and smother it etc. This says it was "mostly chlorine with a mix of nerve gas" and the operating room was "basement-level", the place was "bustling"
Someone at the OPCW "very likely" believed in the silly bunker buster cylinder and story then. I give Darwish and the other people involved in these things more credit. The black sarin for the 24th was "bubbling" this time too.."days later". I wonder exactly how many attacks in the same place it would take to convince the fighters there to move to somewhere safe from all those chemical clouds? For some reason they keep finding(or at least Designated lab3 do) DIMP everywhere. 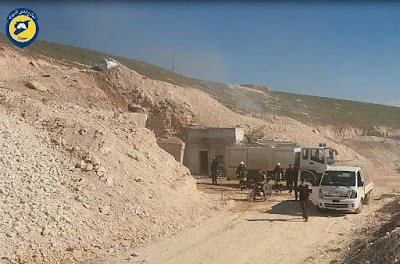 For Khan Sheikhoun the JIM said "the fact that sarin reportedly continued to be present at the site of the crater 10 days after the incident, indicate that a large amount of sarin was likely released". "20180219" is the start of the evidence numbers.. this means the sarin positive crater soil samples were only delivered 332 days later? "During the first interview on 10 April 2017, the FFM received environmental samples relating to the alleged incident of 25 March 2017 from the interviewee. Further environmental samples were provided on 12 April 2017 and 19 February 2018 by an NGO." This is what they say about the other attack, it has evidence numbers starting with 20170410, 20170412 and 20180219, based on this I think the number indeed indicates the date it was received. Then my non-chemist question would be: would it be unusual to find sarin in a soil sample 332 days later? Or even possible? Another questionable part is 5.31 "due to damage sustained to the medical facility on 25 March 2017, it was not possible to provide these [hospital] records and documentation".. apart from the entrance room the place looks pretty intact, what happened to the records I wonder? 6.3 for the 24th says "the FFM was able to place witnesses at the site at the time and corroborate their medical assessment". As they have no documentation for anyone at Latamneh, seems logical they would try to find the two victims 'discharged to another facility' from the records there and this is who they interviewed. These two are the unluckiest men in Latamneh it seems, (5.27) "Subjects alleged previous experience with chlorine exposure"
If these two men were transferred and treated, why is it the apparent locals and even the IHD don't seem to know about the sarin on the 24th? Whoever treated them must have known, they had a.. (5.11) "phone consultation with a physician experienced in treating chemical exposure" specifically "for exposure to an organophosphorus chemical" and then the two mildly injured men were (5.23) "transferred to another facility for continued treatment" of said organophosphorus chemical exposure. There is also crater full of bubbling black liquid that burns everyone who goes near.. which is.. not worth photographing or filming. They only have a grand total of three witnesses plus two doctors and the WH who put the soil in a bag. The "agricultural workers" in 5.57 were even still working in the valley the next day but the sarin didn't make anyone else sick. And then the White Helmets produce this soil sample for the OPCW that still has sarin present such a long time later. And matches the Khan Sheikhoun samples. 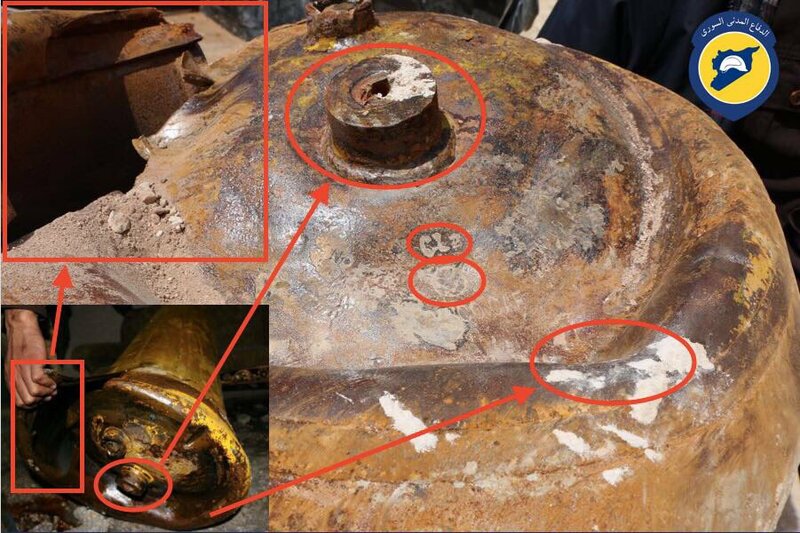 The FFM received the soil samples for the 30th as evidence on April 12th with the video of the collection that the OPCW used to identify which chemical bomb consistent bits they were interested in (the video only seems to become evidence months later for some reason). 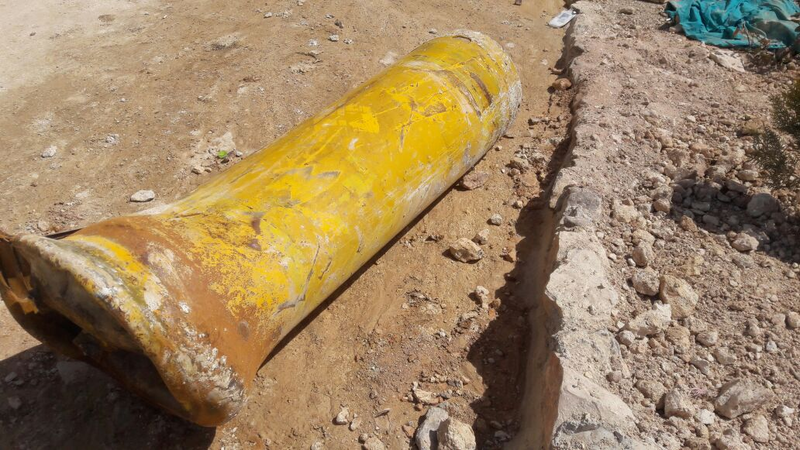 I wonder why WH Abd al-Munaf Faraj al-Saleh told HRW on April 8th "they could only find very small pieces of the munition on the ground" - it seems a strange thing to say if the White Helmets have just made a video for the FFM of a entire field full of different remnants? For the record, I think the "similar to water" comment about the crater on the 24th may just refer to it being liquid rather than the liquid's colour. 4.9 "These [allegations] included on 24 March (in Ltamenah, Khattab and Qomhane) and on 3 April (in Hobait and Al-Tamanah); all in 2017." "3 - The French services have no information to support the theory whereby the armed groups in Ghouta would have sought to acquire or have possessed chemical weapons." "France has no information confirming the possession of sarin by these groups." So considering the supposed all-knowing infallibility of French intelligence, isn't it interesting that the 24th didn't even appear in their list? The Case Against "Syria's Disappeared"
Al-Quds Hospital Blast: An Inside Job?